For a more comprehensive version of this story, check out the article in Pacific Horticulture Magazine here. Gardens and sculpture: they have been together for centuries. Since art and gardening are both huge parts of my life, it makes sense that I am so enthralled with the stone sculptures of Portland artist Michihiro Kosuge. I am fortunate enough to work at the Laura Russo Gallery in Portland, Oregon. The gallery has been here for nearly 30 years, building a tradition of exhibiting contemporary art of the Pacific Northwest. Michihiro Kosuge is represented at the gallery, and I am lucky enough to work with this fine individual and see his work placed in gardens and public spaces throughout the region. This piece, pictured above, is a public work sited at the Hotel Modera in Portland. 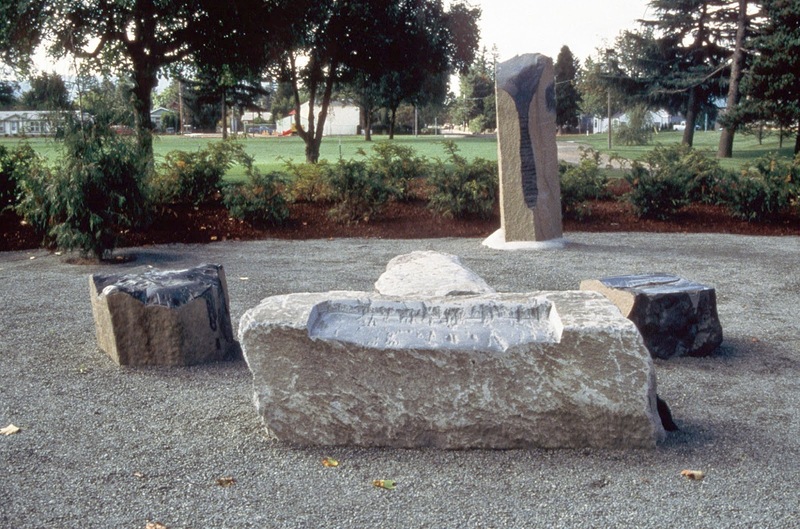 The entire commission, titled Continuation, consists of five separate (but related) sculptures both at the hotel and in the Tri-Met bus mall nearby. 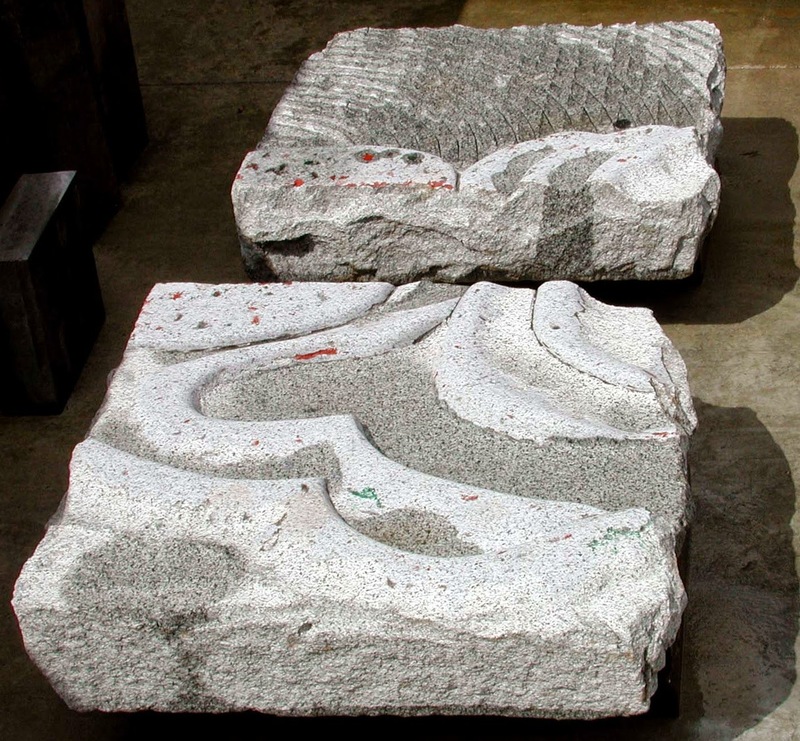 The primary material used is recycled granite from earlier sculptures at the same bus mall. Michi, as he is known, works closely with planners, architects and landscapers and has on many occasions provided landscaping as well. He is quite thoughtful about the relationship between sculpture and gardens, as seen here with a gorgeous wall garden in the background. Michi has created many sculptures with gardens in mind, as he is himself a gardener and lover of the outdoors. It is with this spirit that I share here an intimate look at his work with you. Here is the man at his home and studio, Samurai Studios, in Scappose, Oregon. Michi was born in Tokyo in 1943, attended Tokyo Sumida Technical School of Architecture and eventually made his way to San Francisco where he attended the San Francisco Art Institute and earned a M.F.A. He's been in Portland ever since, teaching sculpture at Portland State University and serving as the Chairman for the Department of Art there for several years. Now retired, Michi works on his art while enjoying the 6.5 acres of gorgeous semi-forested land where his home and studio are located. I recently visited Michi at his studio and was able to see many of his works from across the decades scattered throughout his property. Not only will we take a tour of his home and studio, but we'll visit some of his commissioned works or sculptures placed in garden settings around the area. Michi's primary material these days is granite. The green crane on the left is for lifting these massive pieces. Stone is a slow process; Michi says it teaches him patience. Isn't that true for gardening, too? 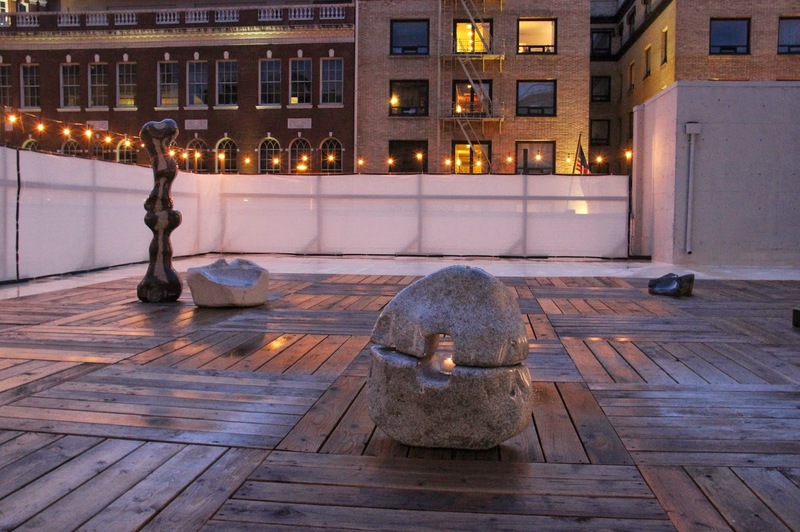 His primary goal when creating sculpture is to think about where it might be positioned and to create a sense of place. That's what gardeners do too, isn't it? 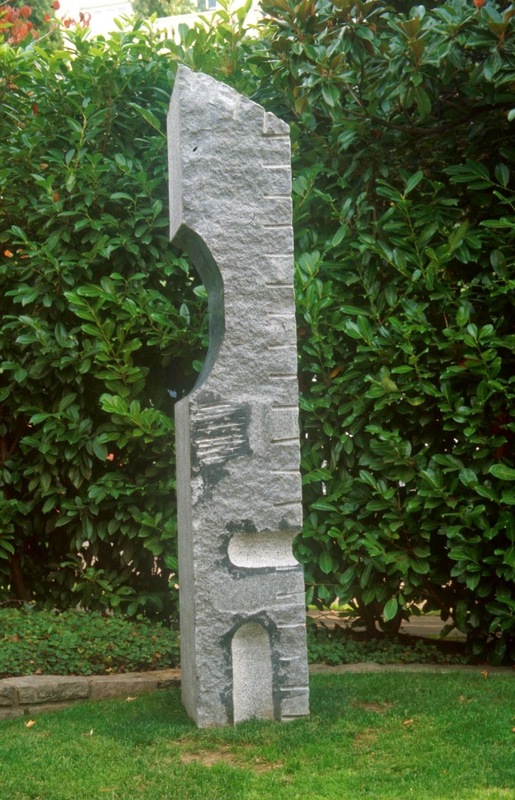 As a sculpture is sited, it changes the nature of the garden. As the garden changes, the relationship between the sculpture, the garden and the space itself changes. The nature of differing materials is the push and pull of textures, weight and light. Above in the foreground is a sculpture titled Upright Circle, consisting of basalt and wood. It is very subtle in the landscape, and difficult to photograph. It does, however, create a definite sense of space and somehow changes its surroundings. Here is a detail of Upright Circle. Imagine placing something so wonderful in your garden and what it would do to a garden space. 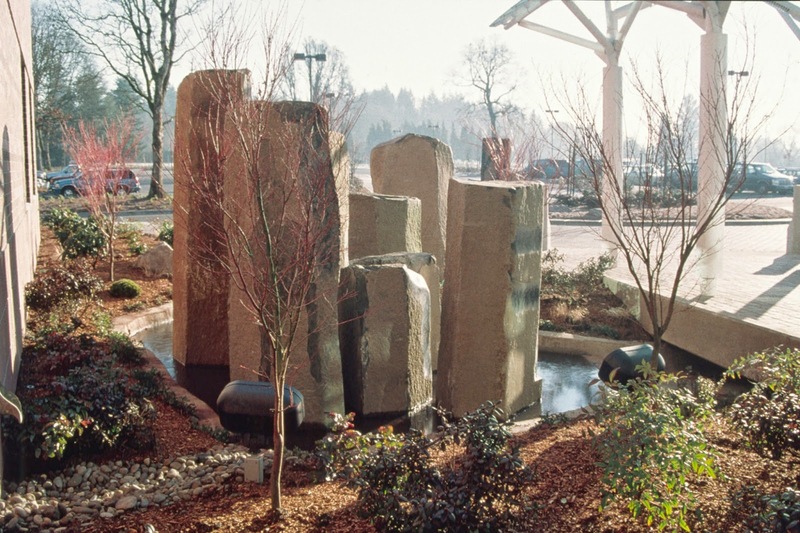 This is a commissioned sculpture at Kaiser Permanente in Vancouver, Washington. Another commission: This one at Ed Benedict Park, Portland, Oregon. Definitely made for interaction, not just looking. Kokoro, which is sited in a private garden. As the plants grow and seasons change, the relationship between the garden and stone changes, too. This is a commission for a private residence. 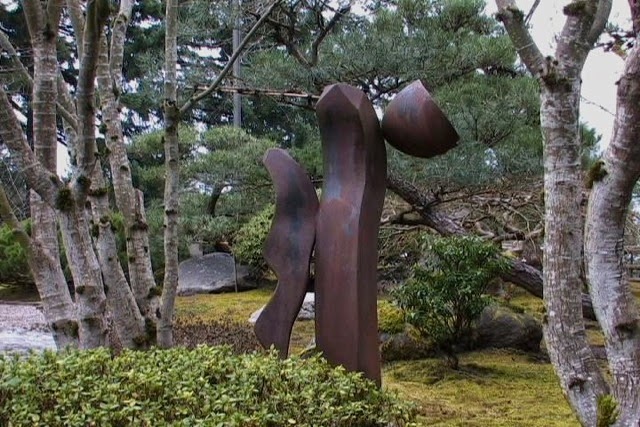 Untitled, from 1975, welded steel sculpture at the Japanese Gardens in Portland, Oregon, exhibited in 2008. Photo courtesy of Diantha Knott. 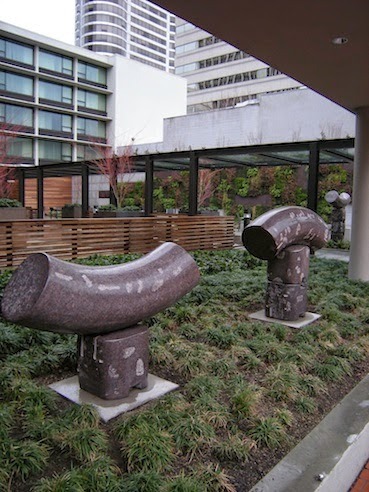 Here are two of the five sculptures for the Hotel Modera and Tri-Met commission. Michi siting and installing one of the Modera hotel sculptures. 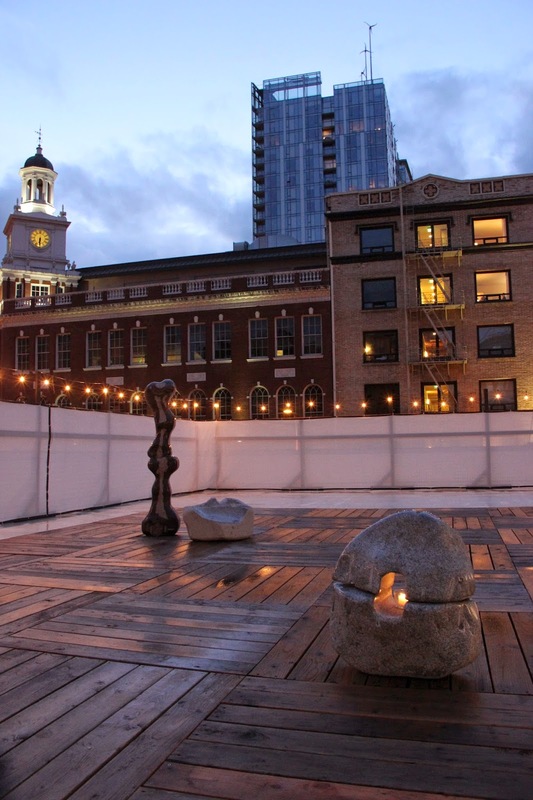 Not technically a green garden, this is an installation at PICA (Portland Institute for Contemporary Art) in 2013 on its rooftop garden. The piece in the center is titled Navel and is made to hold a candle in its center. It's one of my favorites. These are granite sculptures. Another view with a bit of downtown Portland in the background. This is a memorial to a loved one, he planted three different bamboos behind, each significant in its own way for Michi. Detail of different textures of both polished and rough granite. As the sculpture reaches for the sky, the bamboo grows along with it. 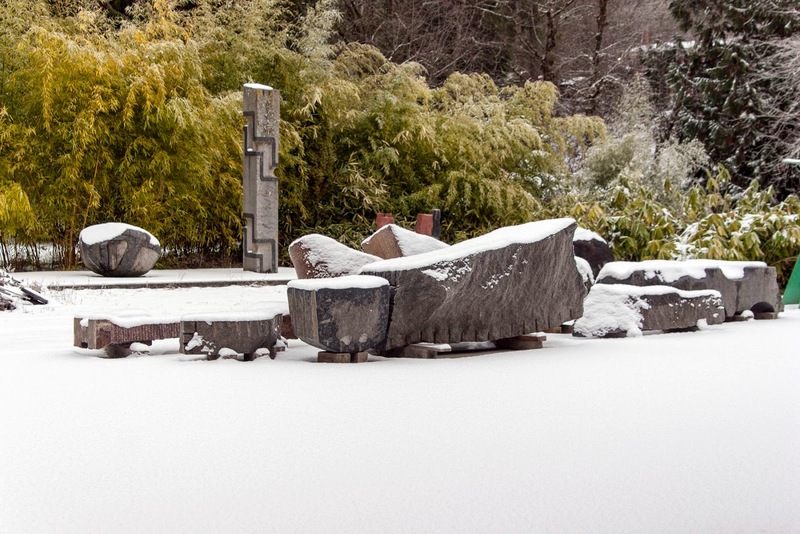 To illustrate how sculpture and the garden change with the seasons, this was taken this past winter. No attempt at manicuring the wild woods behind, these sculptures fit right in and feel like a perfect match. This is the beauty of Michi's sculptures. However, I must emphasize that he puts a lot of thought and contemplation when creating a commissioned piece to create a specific sense of place. Sculptures that blend right into the grasses, literally like ancient Roman ruins. 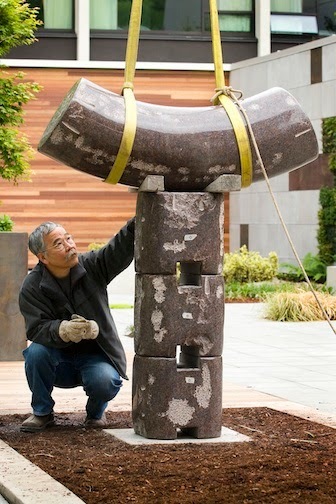 This photo beautifully illustrates the process of splitting these large granite columns. Those little notches along the edge once had pins in them; Michi would go by once or twice a day and carefully tap each one. This goes on for weeks until the piece finally splits. Patience, indeed. He says the sounds the taps make change when the piece is ready to split, he can tell when it's ready. Obviously, time is a major element when carving stone. These works take a very long time to complete. One of the Petroglyph series. This piece titled Volcano Flow is inspired by the volcanic flows of Hawai'i. He decided not to clear off the pine needles for my visit so I could see the contrast in textures. Here it is without the needles. Here we have the final parting shot, Volcano Flow with his home in the background, surrounded by the forest and gardens. Michi is a man whose art and gardens intertwine with such elegant simplicity, I have great admiration for him as an artist, teacher, gardener and friend. I count myself lucky to be able to work with him and live with his sculptures both at the gallery and throughout the city and its surroundings. For a more in-depth look at Michi's process, the local program Oregon Art Beat recently filmed Michi at his studio, here is a link to that episode. 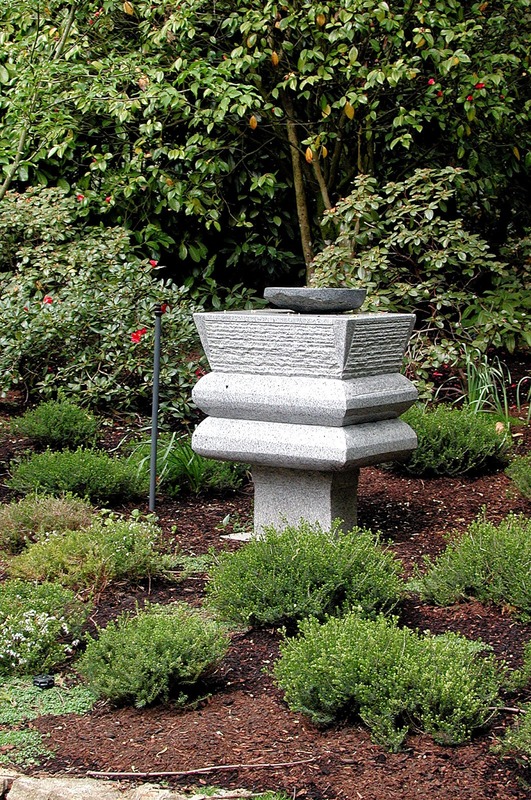 Sculpture in the garden is a very personal matter, as are plant choices and styles. The sense of place is central to what I want for my own garden, Michi's sculptures speak to this sensibility beautifully in my mind which is why I felt so strongly about sharing his vision. Please share stories of sculpture in your own gardens! Thank you for reading and until next week, happy gardening. What a fun outing and a brilliant artist. I really like Volcano Flow. I didn't realize you work at the gallery. Laura was an old friend (our daughters were best friends throughout their years at Catlin Gabel School). This is a lovely tribute to an incredible artist: his work, philosophy and process. Hi Ricki, yes I do - please do come by the gallery someday and say hello! I almost posted a photo of Laura's Meadow, I'll show it to you someday. Really wonderful. This is a lovely tribute to an incredible artist: his work, philosophy and process. I didn't realize you work at the gallery. Laura was an old friend. Our daughters were best friends throughout their years at Catlin. I have always enjoyed Michi's work, but haven't seen a lot of pieces. Thank you for showing so many wonderful examples and tying them together with your thoughts on the garden! Hi MulchMaid! You are so welcome, I love his work and it deserves to have more exposure. Thanks for reading!! Wonderful post, wonderful artist! I love Volcano Flow. Me too, Heather....maybe it's the Hawai'i connection....lovely sculpture indeed! Thanks for reading and commenting, Mindy. Yes, I feel the same way, his work is amazing.